There’s a brand new rock star romance series ready to set the pages ablaze! 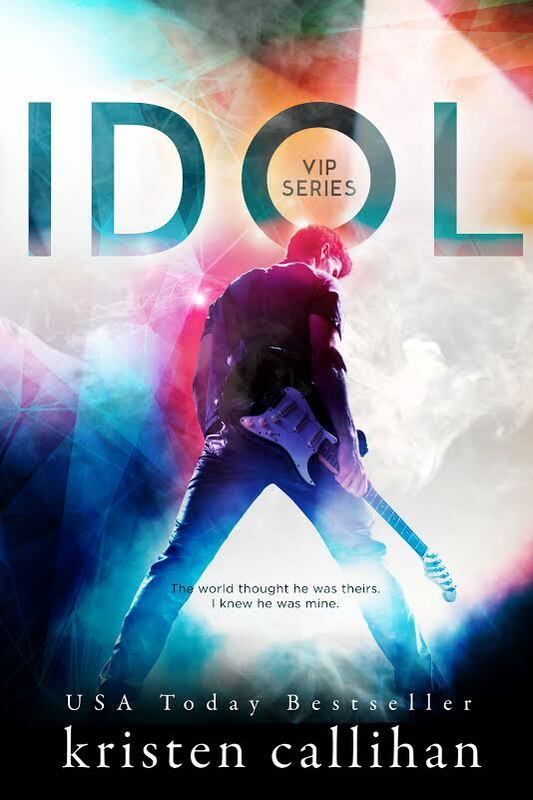 Bestselling author of the Game On and Darkest London books, Kristen Callahan, is launching the VIP Series, with its first sizzling installment coming June 7th—Idol. Feast your eyes on this vibrant, hot-as-hell cover! Along with my friend and blogger extraordinaire, Natasha Is A Book Junkie, we’re not only revealing the cover, we’re each giving you a different sneak peek into the book—so make sure to visit Natasha’s post too! To make things more exciting, Kristen is giving away a $50 Amazon gift card to one lucky winner! Scroll down to the bottom of the post for all the details. He turns into me, running the tip of his nose against mine. Everything feels languid, hot, slow. His touch, mine. I nuzzle his neck, drawing in the scent of his skin. He smiles, small and smug. A low hum vibrates in his throat. Thanks for sharing the awesomeness with us and for the giveaway! Love this blog, thanks for the great giveaway….. I love this author and her books! Thank you for the giveaway! Shared! Can’t wait to read it! Love this cover and can’t wait to read! Kristen Callihan is awesome! Since, The Game Plan, I’m a huge Kristen Callihan fan and want to read everything she does. I can’t wait to check this out. She’s gone from Sports stars to Rock stars… Two of my favorites. Thanks for sharing!! I didn’t realize Kristen had a new series coming. Happy Day!! Thank you for this I can’t wait! SHARED! Great giveaway … sounds great too! That cover is amazing!! I love the colours. Great post!! I am looking forward to reading this one!! Love the cover! I am reading The Friend Zone right now and loving it! So, I can’t wait to read this one too! Sharing on Google+. thank you!! Cant wait for thissss! Looking forward to reading,sounds great. Love your bools and cant wait for this one !! So excited for this new series!!! Super excited for this! Been looking for a new series!!! I love this author so I’m excited for this. I love the cover too. “Bite me now.” Oh my GOODNESS. I cannot wait for more! I love her Game On series, and I’m looking forward to reading this one too! Thanks. HOT HOT HOT!! Can’t wait to start this beauty!! Love this cover! I can’t wait! LOVE this cover! I can’t wait for this one, I adore Rock books! Thank you for the giveaway. Beautiful cover, Kristen! Love rockstars romance!!!! Beautiful cover and it sounds great. This book looks so good. Rock stars and Kristen Callihan – a great combo. Sounds awesome, the cover is stunning too! I love her sports romances, and am eager to see how she does rock star romance. GORGEOUS cover!!! Can’t wait for this one to drop! That excerpt is HOT!! Can’t wait to get into this book! Love the cover! Cannot wait for the book! Love your blog, love Kristen Callihan and love this cover. Thanks!! Really Excited for this new Series! Sounds like a hot read! Thanks for the giveaway! I’m dying to read this one. Thanks for the giveaway. Between the cover, the excerpts, and the blurbs …whew,,,the mind reels! I can’t wait to read it. OMG!! I love Kristen Callahan!! Can’t wait for this one! This is awesome! Cant wait to read this! Sounds like a great new series, and I don’t think I’ve read this author before. Thanks for the chance! Wow, cover is really great. I can`t wait! Love your blog Vilma! This sounds really great! A definite one click for me!! New author for me. This sounds like an amazing book and i love the cover ! I love Kristen Callihan and have added this to my tbr!! This book sounds amazing! Can’t wait to read! Love the cover and am very excited for a new contemporary romance series by Callihan. I love all the Game On books. Looking forward to reading ‘Idol’!!! love the cover! shared on FB, Thank you for the giveaway! This cover is absolutely stunning! Thank you all for the awesome giveaway! Love this cover and I am really looking forward to reading this! Thanks for the great giveaway! Every day it’s getting closer!!! Looks GREAT!! Can’t wait to read this one!! Love Kristen’s writing, can’t wait to read this one. I’d love to read it! Thanks for the chance! Really looking forward to this one! Right up my alley ?